Cell Phone Contracts » Champ Marketing » 23 Years Young! 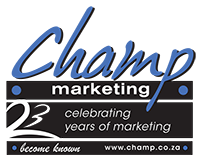 The team at Champ Marketing offer business contracts to the SME’s and Corporate Business. Their promise to offer the best deals at discounted rates. Service will be their first priority in this new venture.